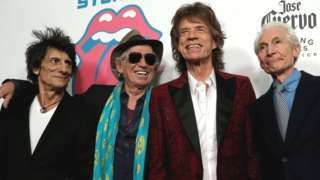 The Rolling Stones have topped the UK chart with their latest album Blue & Lonesome - their first original studio album to reach number one for 22 years. It notched up 106,000 combined sales across all platforms - the second highest opening week sales so far this year behind David Bowie's Blackstar. Blue & Lonesome is the 12th album by The Rolling Stones to reach number one. The Official Charts Company said 95,000 of the album's sales were physical - the rest were downloads and streams. It was also the only new entry in this week's top 40. The last Rolling Stones album to reach number one was a 2010 reissue of Exile On Main St, but 1994's Voodoo Lounge was the band's last album of original studio material to top the chart. The news came a day after Sir Mick Jagger became a father for the eighth time at the age of 73. Last week's number one - Glory Days by Little Mix - has dropped to number three this week. Michael Ball and Alfie Boe's Together has held on to the number two spot, while Elvis Presley and Olly Murs round off the top five. On the singles chart, Rockabye by Clean Bandit - which features Anne-Marie and Sean Paul - has held on to the top spot for the fifth week, giving the band their longest ever run at number one. It has now overtaken their 2014 single Rather Be, which spent four weeks at number one. The rest of the top five is unchanged from last week's chart. Mariah Carey's All I Want For Christmas Is You has jumped 23 places to number six, marking the first time the track has appeared in the top 10 for nine years, according to the Official UK Charts Company. Rag N Bone Man's Human has entered the top 10 for the first time, reaching number eight. Earlier this week, he was named the winner of this year's Brits Critics' Choice Award. Theresa May pledges to help schools and companies deal with the "injustice" of mental illness. Can AI help create a meritocracy? Can Bangalore win its battle against garbage?